The severe atmospheric pollution that has engulfed Beijing for nearly three weeks is “much more frightening than the Sars virus”, a top respiratory health expert said. “There were many ways to get away from Sars… you could have avoided it by leaving [a room] or taking different methods of prevention, but air pollution, indoor pollution – you can’t run away from it,” said Zhong Nanshan, a Chinese Academy of Engineering professor and head of Guangzhou’s Institute of Respiratory Diseases, during a news segment on CCTV on Wednesday. Zhong played an instrumental research role during the 2003 outbreak and helped set up Guangdong’s guidelines for prevention and management. More flights were cancelled at Beijing Capital International Airport early Thursday morning after the haze and smog showed no signs of dissipating. Visibility levels fell to only 300 metres the evening before. Low visibility caused the cancellation of at least 20 flights at the Beijing airport, which included international flights to and from Kiev, Paris, Tokyo and Newark. Bad air and thick smog have infiltrated the city for about 19 days, the most on recent record. Doctors in Beijing said Thursday that hospital admissions for respiratory complaints rose in recent days. The number of patients admitted to several hospitals in Beijing complaining of respiratory problems rose 20 per cent “in recent days”, the Beijing Morning Post reported. Half of those admitted to a children’s hospital in Beijing were suffering from respiratory infections, the newspaper said. The latest data, from the city’s US embassy Air Quality Index at 10am, showed the level of PM2.5 – particulate matters small enough to cause threat to human health – to have dropped to 233 micrograms per cubic metre, lower than Wednesday’s reading of 305 at 5pm, but still considered “very unhealthy”. 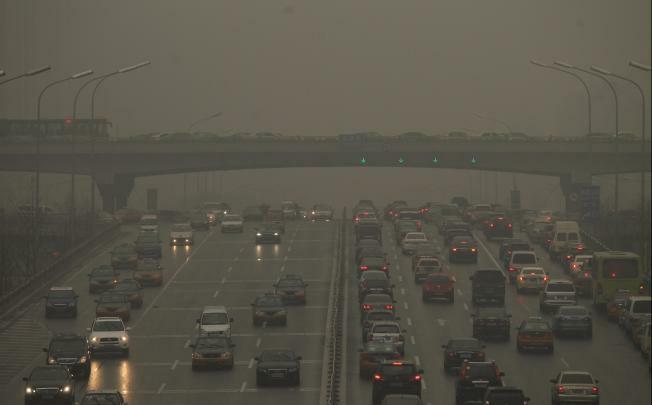 Beijing has urged residents to stay indoors. Unable to take a fresh breath of air for nearly a month, netizens took to Sina Weibo to vent their frustrations. “We open the windows and suffocate from haze and air pollution. We close the windows and then suffer formaldehyde poisoning. This is the high price of GDP growth,” one user said. Beijing has temporarily halted operations at 103 factories, while government agencies and state-owned companies have been ordered to cut vehicle use by 30 per cent. The rules however prove difficult to enforce. Although, government cars have been ordered off the road, the Beijing Times reported on Wednesday that 875 vehicles from the government-run bus line had flouted the restrictions and taken to the roads. Large swathes of northern China have also been affected. In Jinan, Shandong province, PM2.5 stood at 207 on Thursday morning. Jinan traffic police said on Weibo that traffic police were now being forced to wear N-95 protective facemasks after 37 per cent of traffic officers reported flu-like symptoms, coughing and tightness in the chest. Most of us would agree that reducing waste at source, recycling and reuse is the best long-term approach to Hong Kong’s waste disposal. But let’s face it, given the 18,000 tonnes we generate daily, there’s no way that the “three Rs” can prevent our garbage from filling up all three landfills by 2019. The landfills will have to be extended. And thermal decomposition technology will need to be employed as well. The critical questions are: what is the technology, and where should this technology be located? It’s important to note that thermal decomposition technology is not limited to incineration. It encompasses newer, more advanced technologies that need a little more vision to consider. Unfortunately, the Environmental Protection Department has only applied tunnel vision to the problem so far. Since 2007, it has been fixated on building a colossal incinerator costing HK$15 billion that uses old technology to burn 3,000 tonnes of waste a day. Worse, the department proposes to build this bonfire in the pristine natural environment of Shek Kwu Chau, off south Lantau. The way the department has been pushing this mega incinerator, you’d think there was no alternative. But there is. A more flexible and creative strategy is to build a small-scale, state-of-the-art plasma gasification plant that can be integrated with the existing waste-disposal facilities at one of the current landfill locations. If this plant proves successful, its capacity can be gradually expanded. Phasing it in will minimise the risks of deploying this advanced technology: we can see whether it disposes of our waste efficiently. If the pilot plasma gasification plant performs well, build more at other landfill sites. Adopting cutting-edge technology while managing potential risks would be the approach of a “world city”, rather than putting all our eggs in one basket with a mass-burn incinerator based on sunset technology. The core technology of the moving-grate incinerator beloved of the Environmental Protection Department has not changed in 50 years. It burns waste at 800 degrees Celsius, releasing combustion gases into the atmosphere. Almost a third of the waste remains hazardous ash that needs to be transported to landfills for disposal. Incremental improvements to this technology over the years have mainly involved pollution-control devices to manage – but not eliminate – toxic emissions. In the United States, the number of incinerators using moving-grate technology has fallen from 186 in 1990 to 87 in 2010, due to their health risks and high costs, along with the increase in waste reduction and recycling. No new incinerators have been built in the US since 2010. Last year, the New York City government specifically excluded moving-grate technology in its request for bids to build a new waste-to-energy treatment plant. In Japan, the number of moving-grate incinerators was cut by 25 per cent between 1998 and 2005, when it stood at 1,320. Plasma gasification technology has been introduced at two locations. In Europe, wide-ranging waste reduction and recycling have actually led to an over-supply of incinerator capacity. It is only in developing countries like China that moving-grate incinerators are being constructed in significant numbers. Manufacturers using this technology recognise that it is coming to the end of its life cycle. They are pushing to squeeze profits from it before it becomes obsolete. Although moving-grate technology incinerates waste into ash, the gasification process converts waste into synthesis gas and slag – a type of solid waste – with recovery of energy and valuable metals. Gasification is completely different from incineration; burning does not occur in a plasma gasification unit. Plasma gasification employs extreme temperatures (4,000 to 8,000 degrees) in the absence or near-absence of oxygen, with organic and other materials broken up into chemical elements that are then either collected (in the case of valuable metals), vitrified to produce an inert glass-like slag, or reformed into synthesis gas that can be used as an industrial feedstock or converted to energy. About 100 commercial plasma gasification waste-processing facilities have been constructed worldwide since 1994. Most of these plants are used to vitrify incinerator ash. Others are used to process medical waste, hazardous waste and other difficult types of waste. Two in Japan are treating municipal solid waste, with more being planned. One in Ottawa, Canada, is being built. British Airways recently reached a deal to build plasma gasification facilities that can convert waste into aviation fuel. Four in the US, two in Britain, four in Canada, one in India and one in China are reportedly being planned . An examination of scientific and technical literature, media reports and other sources found no health or safety problems, and few environmental problems, with plasma arc disposal systems. Also, no environmental or health and safety problems have been reported among the eight plants treating materials including asbestos, tannery waste, aluminium dross, catalytic converters, medical waste and munitions. If plasma gasification is the best solution, the obvious question is: Why aren’t there more waste-disposal plants using this technology? The answer is simple: The capital cost is still very high. However, as with any new technology, the cost will inevitably drop as it is used in more plants and adopted by more users. The choice that Hong Kong faces is clear: will it use a sunset, pollutant- emitting technology for a plant built in a pristine environment, or will it judiciously integrate step by step an advanced technology in existing landfills that is being adopted worldwide with much less environmental and health impact? Is the Environmental Protection Department smart enough to understand the difference? Guangzhou has rolled out detailed urban design plans for its Nansha district, with a light-rail line to connect the district to Hong Kong’s airport. The “Guangzhou Nansha new zone urban general plan 2011-2030” was posted on the city government’s website on Monday for 30 days of public consultation, ending on February 26. The plan includes a subway system, with seven lines and 34 stations linking Nansha to airports in Shenzhen, Guangzhou and Hong Kong and Guangzhou South railway station. A planning expert at Nansha’s district government said it was proposed that light-rail lines linking Zhongshan and Nansha to Dongguan , Guangzhou, Xintang and Dongguan to Qianhai in Shenzhen and Qianhai to Hong Kong International Airport would run at 200km/h and be completed by 2020. Dr Hung Wing-tat, a transport expert at Hong Kong Polytechnic University, said the release of the Nansha plan would drive up property prices in the district and attract business investment, but it would also benefit Hong Kong. “Nansha’s regional transport network will serve as a fast tube, drawing passengers to international routes flying out of Hong Kong,” Hung said. He said Hong Kong offered a lot more routes for international flights at better times and that was an “advantage that was very hard for mainland airports to compete with”. However, Professor Zheng Tianxiang , a Pearl River Delta planning expert who was an adviser on the Nansha plan, urged the Hong Kong government to petition Guangdong to revise the link to Hong Kong. He said it would be better for Hong Kong if the link from Qianhai to the airport was part of the mainland’s high-speed rail network rather than the Pearl River Delta’s intercity light-rail network, as it would be easier for millions of high-speed train passengers from south of the Yangtze River to fly out of Hong Kong. Hung added that Hong Kong could expect to lose all of its container port business to Nansha when the new zone was running. Nansha, Qianhai and Hengqin in Zhuhai are three development zones in Guangdong focusing on co-operation with Hong Kong. The Nansha plan says 300 square kilometres – 38 per cent of the zone’s total area – will be used for urban construction. The plan also includes seven environmental zones to protect wetlands and restore areas formerly used for mining. Indoor air pollution contributes significantly to women’s lung cancer risk in China, according to research by Lina Mu. BUFFALO, N.Y. – The hazards of breathing outdoor air in some Chinese cities have been well-documented. Now a University at Buffalo study confirms that breathing indoor air also carries significant cancer risks, especially for Chinese women. The UB study (http://1.usa.gov/Wda5ca), published online this month, in the journal Cancer Causes & Control, found that indoor air pollution that generates fine particulate matter is a key contributor to the high rates of lung cancer among Chinese women, despite the fact that few of them smoke. “Our results show that besides smoking, indoor air pollution contributes significantly to women’s lung cancer risk in China,” says Lina Mu, MD, PhD, assistant professor of social and preventive medicine in the UB School of Public Health and Health Professions and lead author on the paper. While around 60 percent of Chinese men smoke, Chinese women have extremely low smoking rates – approximately 4 percent. However, women’s rates of lung cancer in China are among the highest in the world, approximately 21 cases per 100,000, while smoking accounts for less than 20 per cent of lung cancer cases in Chinese women, says Mu. The case-control study includes 429 Chinese women: 197 who had lung cancer and 232 who were controls. Of the 197 with lung cancer, 164 were nonsmokers while there were 218 nonsmokers in the control group. The study was conducted in Taiyuan city, one of the top 10 air polluted cities in the world according to Asian Development Bank’s 2012 annual report. Taiyuan is a large industrial city in northern China, which is home to heavy industry, including steel, coal mining and processing and electronics plants. A particle mass monitor was used to measure PM levels inside the homes – mostly apartments – of study participants. She adds that hot oil, a staple in traditional Chinese stir-frying and deep-frying, produces carcinogens, and is a key contributor. She says that improvements will depend on significant changes, such as a switch to clean energy sources, the installation of better ventilation systems as well as public education about the benefits of keeping windows open and curbing passive smoking. UB co-authors with Mu are Yanli Li, graduate student, William Scheider, PhD, research assistant professor and Mya Swanson, data manager, all in the UB Department of Social and Preventive Medicine; other co-authors are Shen-chih Chang and Zuo-Feng Zhang of the Fielding School of Public Health, University of California, Los Angeles; Jia Su and Shunzhang Yu of Fudan University; Li Liu, Baozing Zhao and Jianping Shi of the Taiyuan City Center for Disease Control and Prevention and Rrungui Niu of Shanxi Tumor Hospital. There is some dismay among green groups over what they believe is the government’s determination to push ahead with “incineration” as a way of dealing with Hong Kong’s municipal waste. Readers will be aware that plans to build a traditional mass burn incinerator at Shek Kwu Chau off south Lantau were shelved last year by the Legislative Council. However, such despondency appears to be misplaced, since the government is committed to rethinking the project. There has been some confusion as “incineration” has been loosely used to include all processes using heat such as traditional incineration and plasma arc. However, Environment Secretary Wong Kam-sing said in December last year that the Environmental Protection Department would study different technologies for dealing with waste, including plasma arc. This was confirmed recently when another senior figure told Lai See that the EPD would bring in “experts” to brief them, rather than salesmen or consultants. Hong Kong must face the question of whether a fourth airport runway will be needed by 2030, in a new strategic study, the transport minister said on Monday. Anthony Cheung Bing-leung, secretary for transport and housing, told lawmakers in the commerce and economic development panel that the Airport Authority would launch a study about the strategic development of the airport beyond 2030. “It will be a preliminary study into a development strategy beyond the 30’s,” said Cheung. “Developments in Asian transport facilities will be examined, but the question of whether a fourth runway is needed will be unavoidable in the strategic study,” he said. Last March the Executive Council supported the building of a third runway in principle. The authority is currently working on the environmental impact assessment for that project, which will involve reclaiming 600 hectares of land from the sea. But the third runway will absorb the projected increase in air traffic demand only until 2030. The project is backed by the aviation industry but has drawn heavy criticism from environmental groups. Cheung said the airport would continue to increase its handling capacity before the third runway was completed. By the end of next year, the airport will add 14 new aprons – areas where aircraft are parked, refuelled, boarded and so forth. Waste has for too long been a dirty word in Hong Kong. The paucity of discussion has meant that our city faces a garbage crisis that can be resolved only through prompt and decisive action. Chief Executive Leung Chun-ying broadly outlined a viable solution in his election manifesto and the blueprint has been better defined in his policy address and briefings by his environmental team. While the precise details are being worked out, we need to accept that the time for procrastination has long passed. With our three landfills reaching capacity in 2019, the waste management strategies that successive governments have raised, but failed to implement, can no longer be ignored. Each is controversial, which is why the problem has been passed from one administration to the next. But Leung realises that time is running out and he has hard choices to make. Protracted argument and debate are no longer options. The landfills have to be extended; that is unfortunate, but given the amount of time other measures will take, necessary. Waste disposal charges, acceptable to 60 per cent of respondents to a public consultation last year, have to be set and implemented. That will affect the way we dispose of household garbage – a wide-ranging recycling policy will be a central part. Lastly, there has to be incineration. In a city where land is in such short supply, the lack of concerted recycling and incineration is shocking. Both, coupled with landfills, are a necessary part of waste management. But given how unsophisticated our approach has been, the financial outlay will be high: deputy environment secretary Christine Loh Kung-wai put the amount that needs to be spent over the next seven years at a minimum of HK$31 billion. Showing that the perceived solutions have already been given considerable thought, she laid out a timetable for implementation of measures through to 2021, the latest targeted commissioning date for a waste-to-energy incinerator. But timetables and costs are only part of an effective waste management strategy. There has to be community support, and for each envisaged step there will be those who resist. Hong Kong cannot continue with its wasteful ways, though; each of us has to be responsible for what we consume and the waste that we create. It will come at a cost, but the clean streets and sense of civic responsibility that result will be worth it. Chen Liwen is suing Guangzhou’s Environmental Protection Bureau after it refused to fully disclose all the information she requested about the city’s only waste incineration power plant. The 31-year-old, who has investigated pollution caused by inappropriate waste disposal since 2010, says getting waste disposal statistics from government is an important part of her work for an environmental NGO, but few governments provided all the information she asked for, even though the mainland had enacted legislation on the disclosure of government information in 2008. When did you become aware of the waste issue? I started with the climate change team at a Beijing-based environmental NGO, Global Village, after I earned my master’s degree in 2008. I joined another NGO, Nature University, and started focusing on waste issues at the beginning of 2010. After visiting many waste incineration power plants, I realised they’re having a big impact on the environment and society. Why did you sue the Guangzhou environment authority? On July 20 last year, I submitted an application for four pieces of information on the Likeng waste incineration power plant via the website of Guangzhou’s Environmental Protection Bureau. They were: the whole draft of the environmental assessment report on the Likeng project; statistics on air pollutants and dioxin emission by the project between June 2006 and last June; statistics on the production of ash and cinders and how they were treated during the same period; and whether the Likeng project was Guangdong’s major source of dioxin emissions. According to the Regulations for the Disclosure of Government Information, government bodies should reply to public requests for information disclosure within 15 working days. I received the bureau’s written reply more than a month later, which just gave some statistics in the second category of information I asked for. Filing a lawsuit is costly and a last-ditch move for me. By bringing it to court, I hope requests for government information will no longer be so difficult for the public. The Yuexiu district court heard the case on January 18. We’re expecting a reasonable judgment. Which local governments have you dealt with to get information concerning waste incineration? From 2011, we applied for information from local environment departments every time we investigated a waste incineration project or conducted an environmental assessment for such a project. They included the Ministry of Environmental Protection, the environmental protection bureaus/departments of Beijing, Jiangsu , Nantong , Qidong , Sichuan , Chengdu , Guangzhou, Jilin , Fuzhou, Beijing’s Municipal City Administration and Environment Commission and its Municipal Development and Reform Commission. How did they reply to your requests? There were so many unexpected and ludicrous replies. In 2011, the Haian county environment bureau in Jiangsu province replied to us in an e-mail after receiving our application for the environmental assessment report on a local waste incineration power plant. The e-mail contained just one sentence, saying the project had been approved by the provincial environment department. What we got from Beijing’s environment watchdog after applying for statistics on smoke emissions from the Gaoantun waste incineration power plant was a photo of a screen showing monitored data, with one line explaining that we could find the information we wanted from the screen outside the plant. The funniest experience was in January last year, when we applied for the disclosure of 13 pieces of information from the Jiangsu provincial environment department. The system showed we had submitted our request successfully, but they said they had received scrambled characters and asked us to submit it again. Another funny one was from the Haian county government, which said an intern had lost its environment assessment report. What impressed me most was that when requesting environmental assessment reports, most of the local governments suggested we get them from the contractor of the project or the drafter of the report, or said they needed to “make inquiries with related companies because it involves business secrets”, or “it’s not in the category of information the government should voluntarily disclose”. Is this the first time you have filed a lawsuit in order to get government information? Do you think you will win? Yes, it’s the first time. I’m not sure if I can win the lawsuit, and I’m afraid that even if I do, the Guangzhou environment bureau may still not implement the court’s decision. But we will keep moving. The next body we may sue could be the Jiangsu Provincial Environmental Protection Department. We hope that through legal action, environment authorities will face the issue of information disclosure. What else do you do in seeking to reduce the environmental impact of waste disposal? There are three other things. The first is public participation – every week, we invite experts or people who engage in treating waste to give free lectures in Beijing, and invite the public to visit waste incineration plants, waste landfill sites, recycling plants and communities which are sorting waste. The second is field investigation. We investigate places where local residents complain about pollution caused by improper waste disposal, circulate the news if it’s true, and help locals solve the problem. The third is that starting from last year, we have tried doing tests on pollution on our own, in co-operation with some universities. What are the major problems that China is facing now in terms of waste disposal? In major cities like Beijing, Shanghai and Guangzhou or other smaller cities, the governments’ logic in dealing with waste is the same – make sure it’s not in my sight and that’s all. In fact, they have not solved the problem by burning or burying it, but just transferred the problem to the air or somewhere else. For example, we got leachate, solid waste and air pollutants after burning. It seems that some cities have rolled out waste sorting, but few of them actually have a long-term plan on this. In the central government’s five-year plan for waste treatment, on the one hand it says we should push forward with the sorting and recycling of waste, but on the other it also contains a lengthy section on incineration, saying the percentage of waste to be incinerated should be raised and setting goals for different regions. So it seems the central government itself is still thinking more of low-end solutions to the problem.